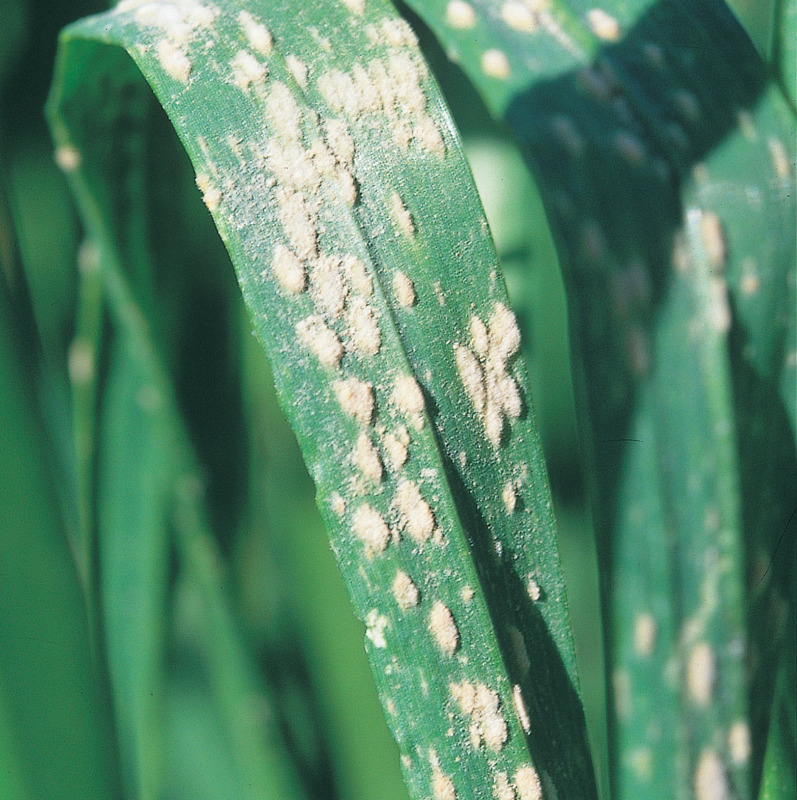 Powdery mildew is a fungal leaf disease that reduces yield and grain quality in susceptible wheat varieties. It can be very hard to control once it is established so strategies are outlined below to avoid or treat early infection. Disease can be both stubble borne and carried over on green bridge, so management strategies include controlling volunteer wheat, crop rotation to avoid stubble borne infection and using foliar fungicides. Powdery mildew can be a constraint to wheat production when susceptible wheat arieties are grown in higher rainfall areas of the Western Australian wheatbelt. It can also be found over greater geographical range in years with high inoculum pressure and unusually widespread humid and wet weather conditions during the growing season. Historically in WA, powdery mildew has not caused significant widespread yield loss in wheat in over a decade. However, in 2015 it was a widespread ongoing issue in the northern and central WA wheatbelt and around Esperance, particularly in widely grown susceptible varieties such as Wyalkatchem and Corack. Summer storms and good autumn rainfall created an autumn green bridge and early inoculum in some areas followed by a humid and moist growing season that favoured the persistence and spread of the disease. Again in 2016, powdery mildew was a challenge faced by growers, particularly in areas where inoculum was carried over from 2015 and the weather during the season was conducive which was predominantly the central and northern wheatbelt. Presence of inoculum on stubble from 2016 infection and autumn green bridge in some locations across the wheatbelt have heightened the disease risk in those areas this year. 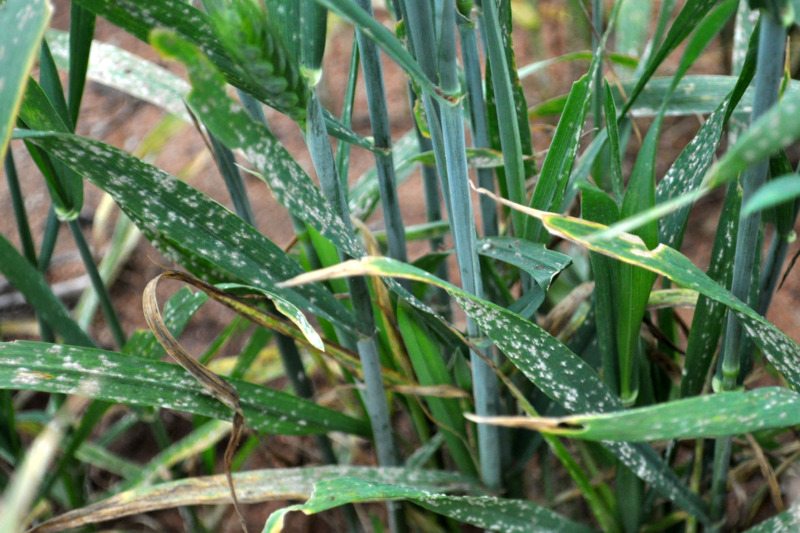 Powdery mildew was observed on volunteer wheat near Esperance before the start of the season. Disease management strategies are discussed here. Powdery mildew appears as fluffy, white powdery growths of fungal spores on the leaf surface. Symptoms progress from lower to upper leaves. Under severe disease pressure as the season progresses, the fluffy, white powdery growth can also affect stems and heads. Fungal colonies eventually enlarge and merge together. The area surrounding the lesion and on the reverse side of the leaf turns yellow to brown. Older infections on leaves and heads turn grey and can develop black fruiting bodies, called cleistothecia, which appear as black specks. Moderate to severe infections can result in leaf death. Young, succulent growth such as new tillers is usually more susceptible than older plant tissues. A powdery mildew infected crop will appear yellow from a distance, similar to a crop suffering from water logging or nutrient deficiency. Therefore, close examination is needed. Details and more photos of the symptoms of powdery mildew are available on the MyCrop page. Infection early in the season can significantly reduce yield (by up to 25%) by reducing photosynthetic leaf area but more crucially by affecting yield potential through causing abortion of young tillers. 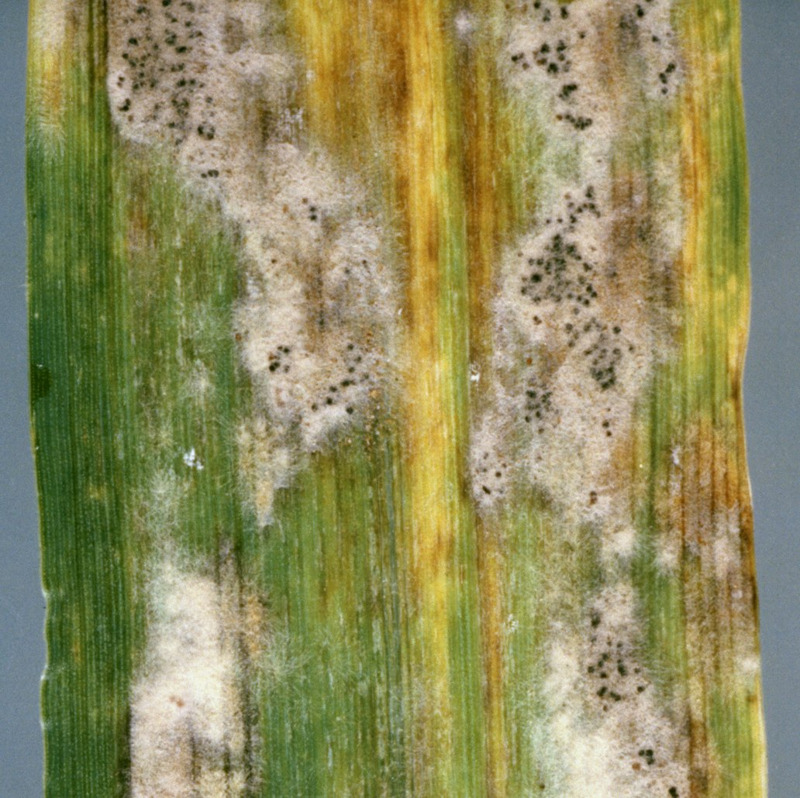 Severe infection of powdery mildew at early growth stages can also cause stunting of plants. Infection later in the season, such as between stem elongation and flowering stages, can reduce photosynthetic leaf area and cause reduced grain size, lower yields and quality downgrades. Severe infection can also cause crop lodging through weakened stems. The earlier the infection and the higher up the plant it spreads, the larger the potential yield loss. Disease development is favoured by high humidity (85-100%) and temperatures of 15-22°C but tends to diminish in spring as temperatures rise above 25°C and as humidity declines. Disease may persist longer in high production situations (such as high rainfall or humid coastal areas) where high seed rates or heavy application of nitrogen fertiliser have promoted dense crops that stay humid over extended periods of time. Severe infection at later stages (after Z39) can cause 5-25% yield loss. In DPIRD field trials conducted in the 1990s and early 2000s where responses occurred from a single spray application, the yield response ranged from <5% to 15-17% (when fungicide was applied from flag leaf to head emergence). In 2015 trials, an average yield response of 10% (range of 3-26%) was achieved from a single fungicide spray in four out of six trials conducted by DAFWA and industry partners Landmark, Imtrade, Liebe Group and Northampton Agri Services. Greater yield responses can occur where powdery mildew is present with other diseases. In trials where disease established at an earlier growth stage (stem extension) and two sprays were applied, responses up to 20-25% have been recorded in high potential areas such as the southern region of WA. DAFWA trial work has found that where mildew is the dominant disease, yield responses are not guaranteed so this is important to keep in mind. For example, in 2015, two out of six trials across the wheatbelt had no significant response to foliar fungicide application. At one of these sites the crop was late sown and hot dry spring conditions hastened disease demise, reduced fungicide impact and limited crop yield potential. If disease is not severe or diminishes naturally (due to warm dry conditions for example), then fungicide is unlikely to provide significant yield benefit. At the second non-responsive site, fungicide was applied too late; the flag leaf was already infected with 17% at time of application and fungicides are more efficient as protectants than eradicants. Results of DAFWA trial research into wheat powdery mildew are housed at Fungicides for Managing Powdery mildew in wheat historical trial report. Control of powdery mildew is more difficult when infection is already strongly established in crop canopies, so growers are encouraged to monitor their crops regularly from early tillering, particularly in susceptible varieties, to detect early symptoms. Particular attention should be given to crops that were early sown, have dense canopies, high nitrogen status and a good soil moisture profile. 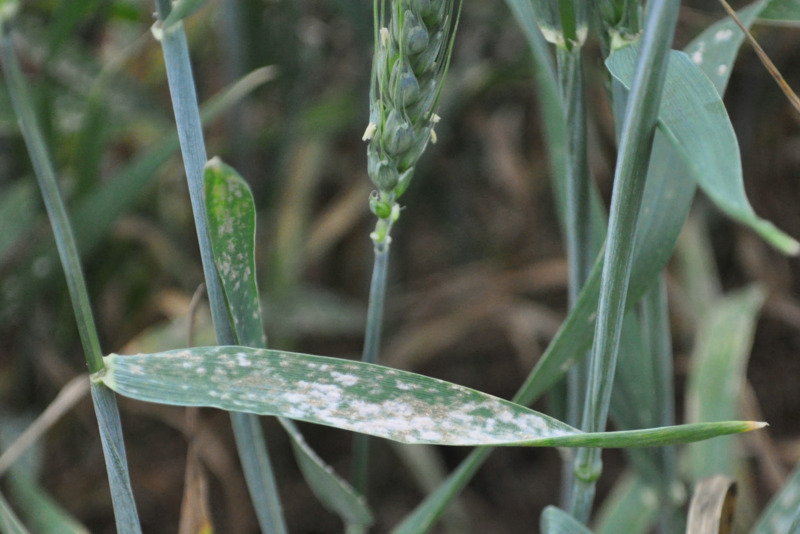 Weather conditions are key to powdery mildew development, if the outlook is for hot (above 25°C) drying conditions; it is likely that disease will diminish quickly reducing the need for fungicide intervention. Keep up with disease reports in your area through subscribing to PestFax. How does the disease carry over between seasons? Wheat powdery mildew can survive between seasons on volunteer wheat plants (green bridge) and on wheat stubble. 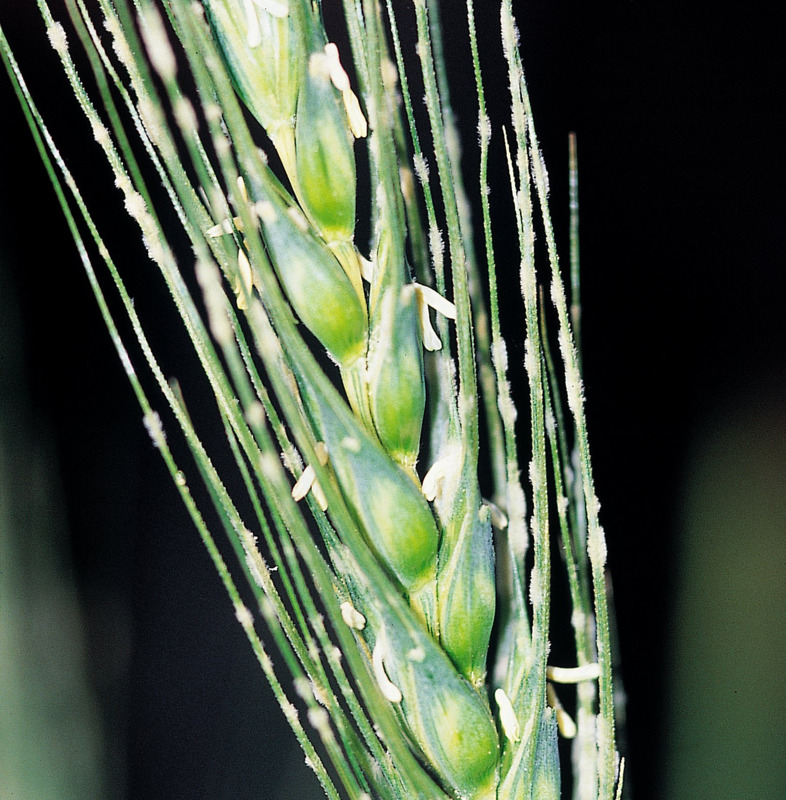 The presence of green wheat regrowth leading into a cropping season provides an opportunity for biotrophic pathogens such as rusts and powdery mildew to generate infection, meaning greater levels of disease inoculum (spores) to spread onto emerging crops at the start of the season. Favourable summer/autumn weather may allow development/persistence of regrowth in some areas, as occurred in 2015 (see soil moisture maps on the Seasonal climate information page - accept the disclaimer, then see the Soil Water tab). Presence of disease on this regrowth is largely dependent on there having been significant disease levels in or near that location in the previous season. The fungus also survives as fruiting bodies on wheat stubbles (from previously infected crops) that release spores after autumn rains. Infection can spread over long distances by airborne spores from the fruiting bodies on the wheat stubble or from the white fluffy infections on leaves once a crop is infected. What conditions favour disease spread? extended periods of humid and damp canopy. Under high inoculum pressure, on a susceptible host with favourable temperatures and humidity, infection can be significant in crops with thinner canopies. Infection development diminishes when environmental conditions are unfavourable. These include dry and warm weather conditions that result in periods of low canopy humidity and temperatures above 25°C. As a result, the disease can disappear rapidly in the higher temperatures and lower relative humidity of the spring months. Powdery mildew has a short infection cycle and produces millions of spores (conidia) so can develop rapidly in the crop. In favourable conditions (optimum temperature and high relative humidity) the cycle of spore germination, infection and subsequent spore production can be completed in as little as seven days. Once infection has established the white fluffy powdery mildew conidia are spread as a secondary infection by the wind throughout the crop. Humid, mild weather and a damp canopy favour development of the disease. The fungus does not require leaf wetness for infection to occur, therefore rain is not required for disease spread but does encourage canopy humidity. Incidence of infection increases as relative humidity rises to 90%, but it does not occur when leaf surfaces are wet (for example, in a rain shower). Heavy rain may actually wash spores off the leaf surface and temporarily slow disease progress.